"I have called on the CPUC to hold a public meeting in Alpine to look the community in the eye and prove that lives and property are not at risk." July 23, 2011 (Lakeside) – Back in February 2009, SDG&E officials met with a packed hall full of residents in Lakeside, including the town’s planning board. 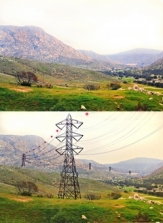 Residents were furious that SDG&E had changed its proposed route to march 40-story high voltage towers through El Monte Valley, a County-designated scenic view corridor. After numerous residents objected to desecration of views, SDG&E representative Laura McDonald promised that towers would be “camouflaged” by painting them tan or green. This reporter was present and can vouch for that pledge made. Don Parent and at least two other SDG&E representatives were also present. But now SDG&E has reneged on its promise to the people of Lakeside—and its representatives have apparently developed convenient cases of amnesia.